PBR - Darin Ruf has gone from a relative obscure minor leaguer to a Philadelphia fan-favorite in the span of just eight months; bashing 52 home runs in three different leagues will do things like that to a ballplayer. The 26-year-old Ruf was in Nashville at the Winter Meetings on Monday to receive the Jim Bauman Trophy for leading the minor leagues in home runs in a ceremony held at the Opryland Hotel. 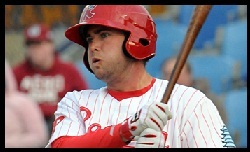 Ruf hit 39 home runs at Double A Reading in 2012. He then hit three with the Phillies in September before launching another 10 in the Venezuelan Winter League. Ruf's stellar 2012 campaign has earned himself a chance to compete for an outfield spot when spring training opens in a little more than two months. "I've kind of always had the mind-set of they'll give me an opportunity to show what I can do in spring training," Ruf said. "I need to take advantage of it. I don't think it really matters who they sign, what they do, if I can show that I can help the team in some way." In 139 games at Reading, Ruf hit .317 with 38 homers and 104 RBIs on his way to winning the Eastern League MVP award. A first baseman his entire career, Ruf transitioned to the outfield late last season because he's blocked by Ryan Howard at the big-league level. He recognizes the change was necessary if he wanted a chance to play everyday. "That's how I'm going to go into spring training: try to win a job," Ruf said. "Playing through the minor leagues I've been a guy that's played 140, 150 games a year. So I don't want that to stop now." Ruf played left field in Venezuela for six weeks but admits he still needs some time to learn the position. "I’m going to be in spring training at least three weeks early working out on the field," Ruf said. "They’re going to give me an opportunity in spring training and I need to take advantage of it."